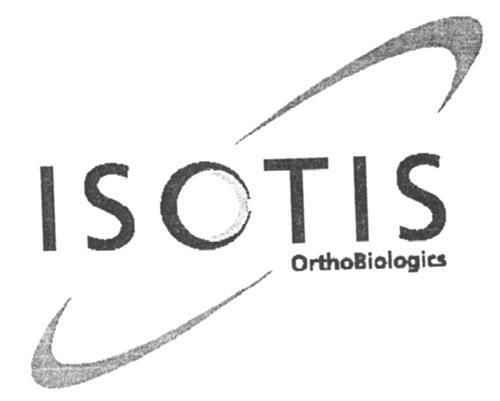 On Tuesday, August 12, 2003, a canadian trademark registration was filed for the above pictured logo by IsoTis OrthoBiologics, Inc. 2 Goodyear, Suite B, Irvine, California 92618, UNITED STATES . The Canadian IP office has given the trademark application number of 1187348. The current status of this trademark filing is Interruption of proceeding. The correspondent listed for is CASSAN MACLEAN IP AGENCY INC. of 336 Maclaren street, Ottawa, ONTARIO, CANADA K2P0M6 The trademark is filed in the description of Scientific research; medical research; medical services, namely, tissue engineering, cell cultivation by means of tissue engineering, bone cultivation. , Chemicals used in industry or science, namely, ceramic materials for use in the manufacture of matrixes for controlled release of medicines, bone fillers, artificial bone, joints and implants; polymer beads or pellets for use in manufacturing; carrier material for the cultivation of cells, for use in vitro, scientific or research use; proteins and peptides for use as tissue growth factors and blood growth factors; human growth hormones; plasters for medical use; surgical, burn and wound dressings; material for stopping teeth; dental wax; all purpose disinfectants; tissue regeneration membranes; implantable living tissue and bone implants comprised of living tissue; artificial limbs; artificial eyes; artificial teeth; surgical implants comprising living tissue, cartilage, bone and skin; surgical implants, namely, bone implants comprised of artificial materials, carrier media for implants; synthetic bone substitutes; artificial skin, bone and cartilage for medical and surgical purposes and for research; biological tissue intended for subsequent implantation, specifically bone, skin and cartilage; artificial bone and cartilage for implementation, specifically bone, skin and cartilage; artificial bone and cartilage for implementation and research; orthopedic articles, namely, artificial joints and implants in the nature of artificial joint implants, bone implants in the nature of spinal fusion cages, plates, rods, and screws; ceramic to be used as bone fillers; polymers to be used as bone fillers for medical purposes; bone fillers for medical purposes; the aforesaid goods also provided with proteins or peptides or growth hormones. .
Mark Disclaimer: The right to the exclusive use of the word ORTHOBIOLOGICS is disclaimed apart from the trade-mark. (1) - Scientific research; medical research; medical services, namely, tissue engineering, cell cultivation by means of tissue engineering, bone cultivation. (2) - Chemicals used in industry or science, namely, ceramic materials for use in the manufacture of matrixes for controlled release of medicines, bone fillers, artificial bone, joints and implants; polymer beads or pellets for use in manufacturing; carrier material for the cultivation of cells, for use in vitro, scientific or research use; proteins and peptides for use as tissue growth factors and blood growth factors; human growth hormones; plasters for medical use; surgical, burn and wound dressings; material for stopping teeth; dental wax; all purpose disinfectants; tissue regeneration membranes; implantable living tissue and bone implants comprised of living tissue; artificial limbs; artificial eyes; artificial teeth; surgical implants comprising living tissue, cartilage, bone and skin; surgical implants, namely, bone implants comprised of artificial materials, carrier media for implants; synthetic bone substitutes; artificial skin, bone and cartilage for medical and surgical purposes and for research; biological tissue intended for subsequent implantation, specifically bone, skin and cartilage; artificial bone and cartilage for implementation, specifically bone, skin and cartilage; artificial bone and cartilage for implementation and research; orthopedic articles, namely, artificial joints and implants in the nature of artificial joint implants, bone implants in the nature of spinal fusion cages, plates, rods, and screws; ceramic to be used as bone fillers; polymers to be used as bone fillers for medical purposes; bone fillers for medical purposes; the aforesaid goods also provided with proteins or peptides or growth hormones.